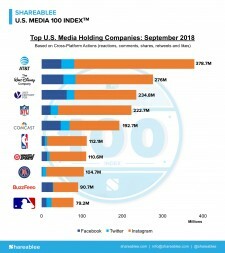 NEW YORK, October 9, 2018	(Newswire.com) - Shareablee Inc., the global leader in audience-based social media measurement, today announced this year’s September U.S. Media 100 Index ranking of the most socially engaged media holding companies. The Shareablee U.S. Media Index represents a total of 3.1 billion cross-platform actions (post-level reactions, comments, shares, retweets, and likes) for Facebook, Instagram, and Twitter. In September, AT&T topped the ranking for the second straight month after merging with Turner Broadcast, with 378.7 million cross-platform actions. Disney ranked second with 276 million actions and Twenty-First Century Fox took the third spot with 234.8 million actions. In the fourth spot, the NFL had 222.7 million actions while Comcast’s 192.7 million actions earned them the fifth-ranked spot. With Football season now in full swing since August’s index, the NFL’s is up 23.6 percent in cross-platform engagement and 68.5 percent in shares. Their Facebook and Instagram actions have also risen 43.9 and 57.7 percent, respectively, during that period. Disney led the video category with 1.2 billion views, followed by Buzzfeed’s 1.1 billion views in second and Comcast’s 732.8 million views in third. 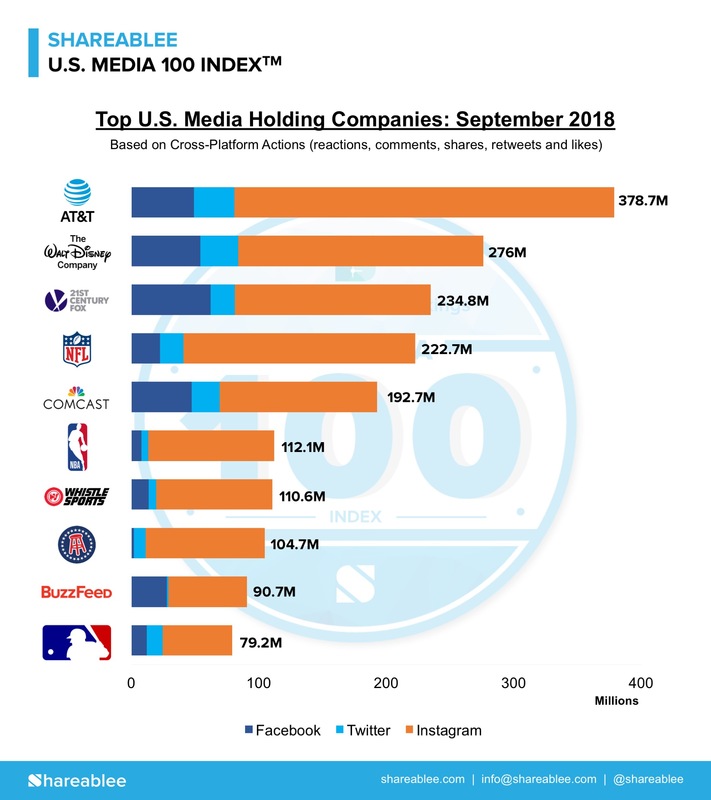 The top five most engaged American media companies accounted for more than 43 percent of all engagement across U.S. Media during September, while engagement for August’s top five surpassed 50 percent.